Would you like to know how to say some basic greetings in Tibetan? How to ask someone’s name? Or how about some important Dharma words you see often in the prayers, or Tibetan names for things you see around the monastery? 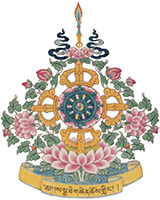 If YES, then you will love this casual, one-session Tibetan Language class, which is designed to be fun but informative enough for you to use what you learn right away. Learn greetings, introductions, Dharma words and more, in an informal setting, and most of all, have fun!